From Oak to Over the Top! There’s nothing I love more than wine, Ryan Gosling, Cornuts, making a small room look bold and beautiful and this wee kitchen satisfied in a BIG way. But here’s the deal – I only have 2 photos. However, this kitchen is so friggin’ gorgeous that I just HAD to share, even if all you get is a before and after – IT’S WORTH EVERY SECOND! And note the detail of the empty drawer space – genius! Just joking, it just wasn’t installed yet. I KNOW, I wish there was more too! But that’s it today – just a quickie. Love the gauntlet gray cabinets on bottom and bright white up top, as well as the subtle wall color with the flooring. Nicely done. Bet they are thrilled! Love it! Any info on the flooring, love the brown gray color of it with the guantlet gray. Oh, Robin, I wish I did – hopefully the owners will read this and let you know! Beautiful, Kylie. It’s amazing how a few simple changes can make such an impact! I would love to know what brand of flooring you used. Great example of making a soffit look great. Very nice. You’ve touched a bit on “Double Cathedral” cabinets before. Do you think that painting just the center panel, or just the outside area, might make the cathedral affect look novel instead of “trying to be up-to-date” and failing? Mine are paler kind of yellowish honey and thought White Dove would be good. This looks fantastic! I love the colour choices. I like the light placement over the sink. My sink in our upcoming retirement home faces a wall (with windows to the side). I think I want to leave it there, but it needs something above it. This idea with shelves and light might just fix it! 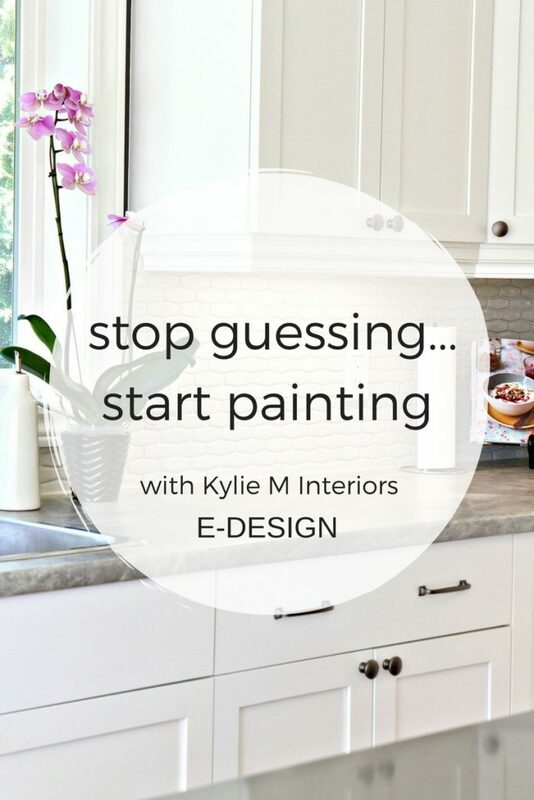 Do you know the wall color paint in this kitchen makeover? I can’t tell if it is a gray shade or a bone/almond/tan family?